There are times during various conversations with readers or people I meet while grocery shopping, where I say something like “I run out of cooking ideas all the time.” You should see the looks I get. During the first couple of years of this blog, I was always apologetic. But reading and reviewing cookbooks is what you do Rob, they told me. Of course it is, but my cookbooks and I are not the beginning and end all, I constantly say. There are so many articles and recipes out there that go beyond the confines of my books. There’s nothing wrong in that. And many times I’ve said, and will always continue to say, that you don’t need any cookbooks to learn how to cook and what to eat. I love my library to bits and am always looking towards expanding, but I learn from anywhere. Preferably from the giants. One giant is Mark Bittman. If you’ve never read him, you should. He’s in my current people-to-look-up-to list, together with Allan Jenkins, David Lebovitz, Nigella (no, no…don’t roll your eyes at me), Ruth Reichl to name a few, together with my blogging friends who are amazing in their own right. There so many talented people one can learn from. So, before I digress completely, I admired Mr. Bittman for many years, as anyone else in this business should do. However, my level of respect for him has gone up even more after I saw this clip from Years of Living Dangerously. Also how can you not admire someone who has published around 17,000 recipes and writes about food in the best possible way – without any BS. As I write this I’m reading this excellent article about him, written shortly after his departure from The New York Times in 2015 to pursue another project. The following is my take on Bittman’s recipe, featured in his “The Minimalist” series. While I never considered myself a Minimalist, I can tell you one thing. This works. In the same mixing bowl you used for the apples, tip in the remaining cinnamon, sugar, butter, oats and walnuts. I used my clean hands to combine all the ingredients together. Alternatively you can use a fork. 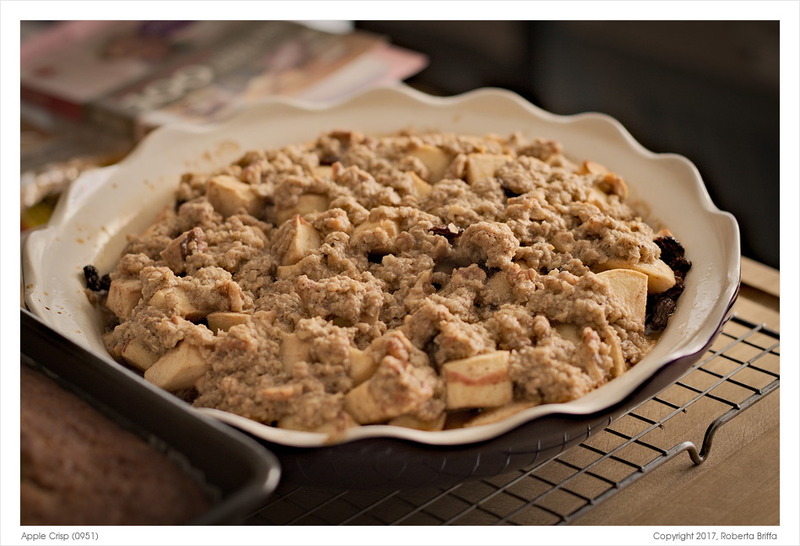 Spread the topping as evenly as you can onto the apple mixture. Bake for 30 to 35 minutes, or until the topping turns a golden brown. Serve hot or warm with ice cream or softly whipped double cream. Or at room temperature with custard.